Clark awakes with a start, gasping for air.�He moves to the window and stares out as Lois is stirred from her sleep.�Lois asks which one it was, and then teases him with some rather humorous situations.�Clark just says it was the one with Zod, the one where he kills him.�Lois asks if he wants to talk about it, but Clark responds that he is going for a walk as he drifts out of the window. Soaring across the sleeping city, Clark comes to rest on an outstretched girder.�He watches a train go by when suddenly he hears a radio transmission.�Gorilla Grodd is tearing apart downtown Chicago (don't ask me why Superman is overhearing the police band from Chicago, but we'll ignore that).�In a second, Superman is there. The Man of Steel supports a falling building as rescuers rush to get the panicked citizens out from beneath it.�Leaving at super speed and returning with a damaged semi to prop the building up, Superman notes that something isn't right.�Grodd is a despot and a calculating terrorist; he was never one to cause random destruction.�Opening his JLA commlink, Superman calls the Flash and asks if he knows the current location of Gorilla Grodd.�Flash responds that he is in the middle of Gorilla City right now, dealing with a civil war that Grodd caused.�Superman offers his help, but then sees a huge gorilla, obviously not Grodd, hurling vehicles left and right.�He talks Wally and signs off the commlink. Superman uses his heat vision to stop the thrown bus, and then tries to talk to the monkey.�With a screech the beast jumps forward and grabs Superman in his massive grip.�Falling through a roof, Clark uses his heat vision to force the monkey back.�Lying dazed on the floor, he tries to show the beast that he is not an enemy.�Instead, a ball of energy forms above the ape's head.�An identical one appears around Superman.�Superman screams in pain. For a moment Superman pictures himself as a monkey, strapped down in a chair and tormented by an evil scientist.�Then, dragging his normal self out of a putrid pool, Superman looks up to see a giant rock formation in the shape of a gorilla, sitting in a cage.�He realizes instantly that he must be in the monster's mind. Superman flies through the unreal landscape when suddenly he gets knocked out of the sky by a tentacle.�Picking himself up out of the mud, he finds a little version of the gigantic ape that he fought outside.�The ape begs him not to hit it.�It wasn't him that terrorized the city.�Outside, something moves him.�Looking skyward Superman sees huge hypodermic needles falling toward him.�Grabbing the monkey, Superman quickly avoids the deadly javelins, and then asks who is controlling the giant ape.�Superman flies the monkey into a cave and sets him down when suddenly a huge claw bursts through the wall and yanks Superman away from the simian.�Out in the real world man and beast are separated with a tremendous explosion. As soon as Superman is free the army opens up with all of their weaponry, but Superman recovers fast enough to dive in front of the oncoming barrage and tell the men to hold their fire. Twenty-five miles away, in a maximum security prison, a scientist prepares a needle with an ominous looking solution.�Suddenly he turns around in shock to find Superman standing behind him.�He tells Superman that he doesn't understand; the beast destroyed his family.�Opening a door behind them, Superman calls to Hector Hammond.�The powerful psychic is strapped in a chair, wires and needles poking into his body from every direction.�Superman tells him that his message made it out.�The cage is open.�A single tear runs down Hammond's cheek. Outside Superman talks with the head of the prison.�He says that it was lucky that Hammond was the only powerful telepath locked up in the area or he might not have been able to find him.�The doctor tells Superman that Hammond isn't showing any permanent damage, but only time will tell.�Hammond was a mute, he had no conventional way of crying out, but the primitive sections of his mind were still crying out for help. As Superman takes off into the sky, the doctor calls up that despite the cruelty of the rogue doctor, none of this would have happened if Hammond hadn't killed the man's family.�Monsters create monsters.�Superman just says that sometimes, cages do too. As he flies away Superman thinks to himself.�Zod may be holding the keys to his own cage, hope can unlock any cage. Story - 3: I'm not sure what to think.�On one hand I like some things.�I like the Zod angle being worked back into the books.�The Zod story is supposed to be coming to a head soon, so Kal should probably be thinking about the guy.�I liked it when he went for a "walk".�I absolutely loved it when he called up Wally and asked about Grodd.�It made sense; he's fighting the foe of another so he calls up and asks for information.�He actually did something that a logical person would do in that situation.�That was cool.�I liked having Superman try to talk to the ape instead of just throwing him in Lake Michigan or something like that.�That was the good.�However, there was some bad too.�I'm still not clear why this whole story happened in the first place.�I realize that it is supposed to show him a way out of his dilemma with Zod, but it seemed really forced to me.�Plus, where did Hammond come from anyway?�I liked some points in the issue, but the whole story just didn't appeal to me.�On the second read I did enjoy it more, so I have to go with average, but I really hope the future issues are better that this one.�This was not a good issue to have come right after a "jump-on point for new readers".�At least next month is big 800.�I love anniversary issues. Art - 2: And then there's Meglia.�You would think DC would have learned their lessons after apologizing for the last time he did the book.�But no, he's back again.�In all fairness to Carlos, I did enjoy the first few pages.�Clark getting out of bed and talking with Lois and then flying around the city somewhat appealed to me.�I wouldn't say I liked them, but I could appreciate them.�But then we hit the rest of the book.�The ape looks horrible, for some reason the doctors from the prison look like apes as well, and almost everyone has this really strange stubble that looks more like straws glued to their chins.�Like I said, a few pages were quality, the rest, crap.�Because of those few I can give it a two, but that's only barely.�This is not the kind of art I want on Superman, and I feel that most people probably agree with me.�Meglia has his place, and that place is anywhere far away from Superman. 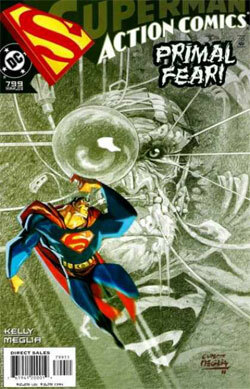 Cover Art - 3: The cover has a similar situation.�The background is quite good.�The shaded look with the monkey/Superman combined with the needles and wires was perfect, not enough to stand alone as a cover but ideal for a background.�And then for some reason some four-year old broke into the DC offices and scrawled a poor depiction of Superman in the middle of this.�Not to mention the fact that Superman is just in a pointless pose flying across the cover anyway, but Meglia art ruins this too.�I give it average because I really do like that background, but that horrible looking Superman is like an omen of what's to come inside.